Difference #1: More Ceremonial, Less Religious or Legal Almost half (46%, according to Pew Research) of Koreans have no religious affiliation. A growing number (29%) identify as Christian, mostly Protestant, while a quarter consider themselves Buddhist. As a Catholic, I am used to the concept of weddings being a sacred ceremony before God. In America, even many Protestants marry in a church. 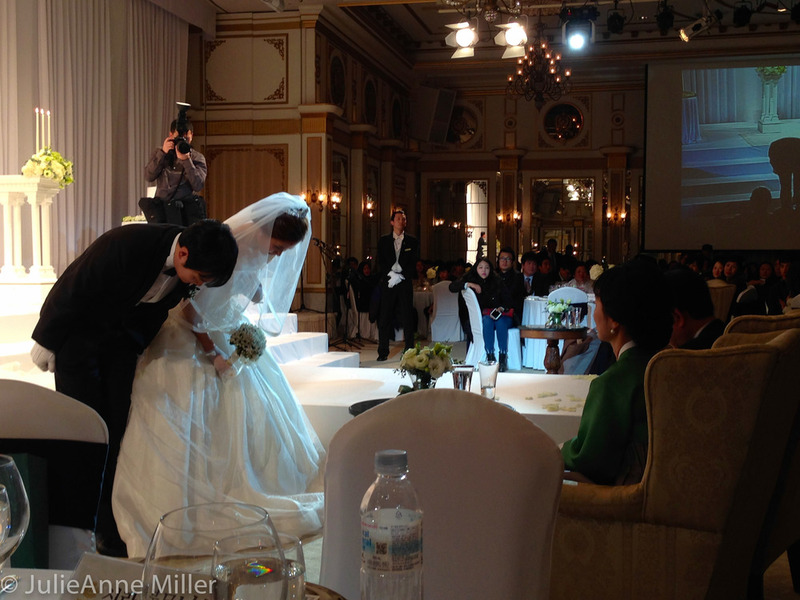 In Korea, wedding events usually take place in a special wedding hall or hotel; rarely in a church. 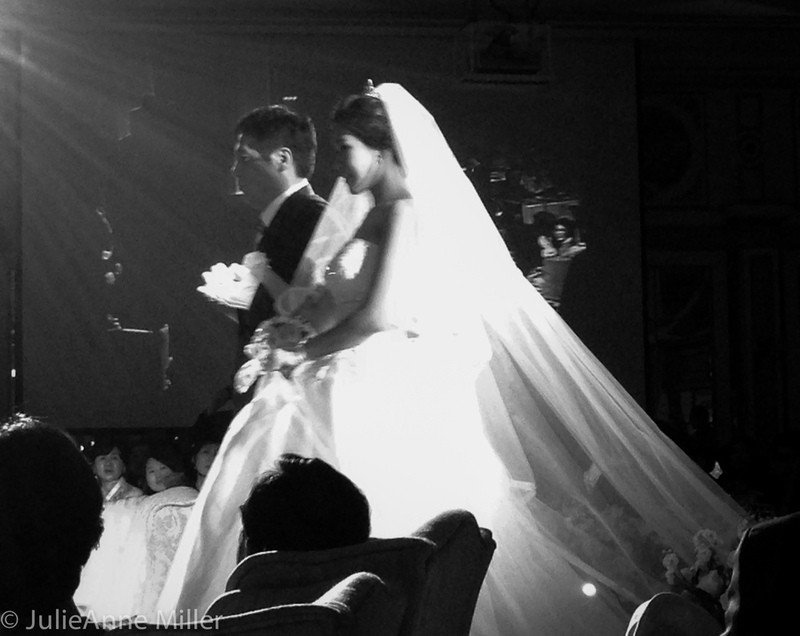 The emcee is often the groom's best friend, with vows presided over by a university professor, a senior mentor, or some other honored figure in the couple's life, rather than a minister, pastor, or other religious authority. Difference #2: Bride on Display In western culture, we believe that the groom seeing the bride in her wedding dress before the wedding is bad luck. Almost no one except the bride's mother and wedding attendants see the bride before she walks down the aisle and all photos of the couple in their wedding garb are taken after the ceremony. 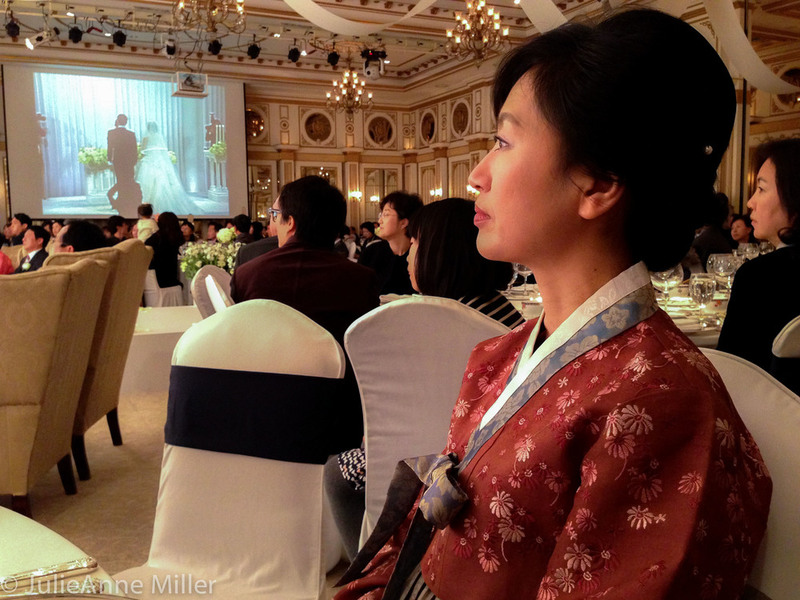 In Korea, the couple takes photos in their wedding attire weeks before the event. The day of the wedding, the bride sits in a receiving room. As guests arrive, everyone greets the bride in her gown. The groom roams in and out of the receiving room. 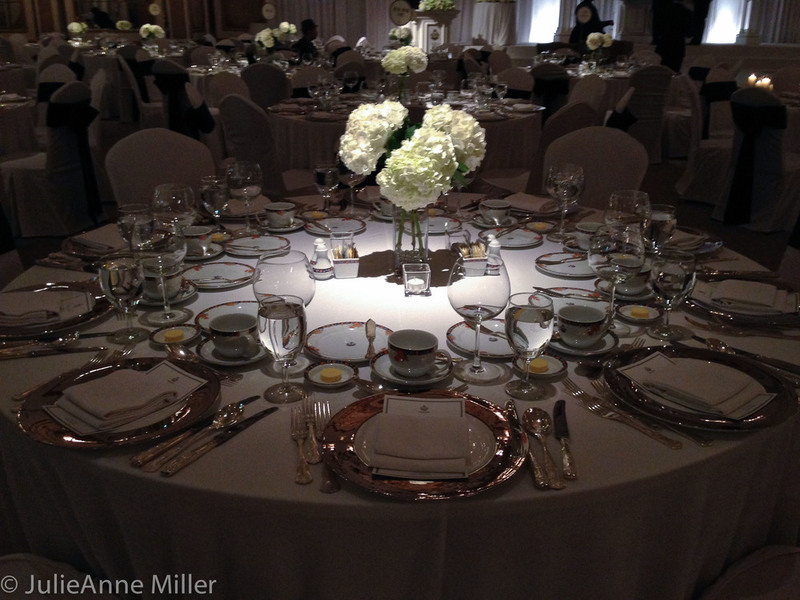 Difference #3: Mingling of Ceremony and Reception: After greeting the bride and groom, guests enter the dining room and are seated at tables to await the ceremony. The ceremony takes place on a stage. 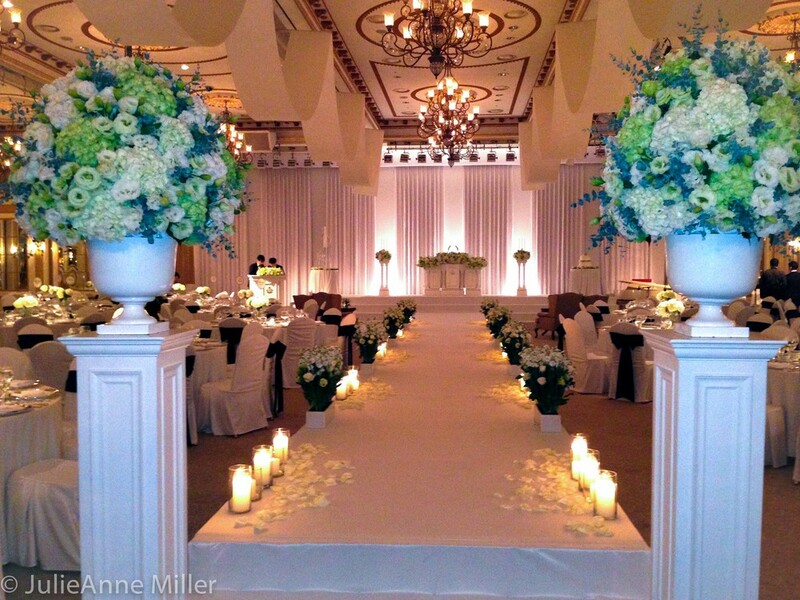 The bride's family is usually seated at tables on the right; groom's to the left of a raised runway (the "aisle") leading to the stage. Drinks and snacks are served, which guests nibble on during the ceremony, often chatting away among themselves even as the ceremony is on-going. After the brief 15 minute ceremony, there is some form of light-hearted entertainment: the couple's friends might sing or the couple may exchange poems or play an instrument for each other. Then dinner and dessert are served and guests are free to leave. The "let-loose and party" western-style reception with drinking and dancing might occur later in the evening, with just the couple and friends going out on the town. 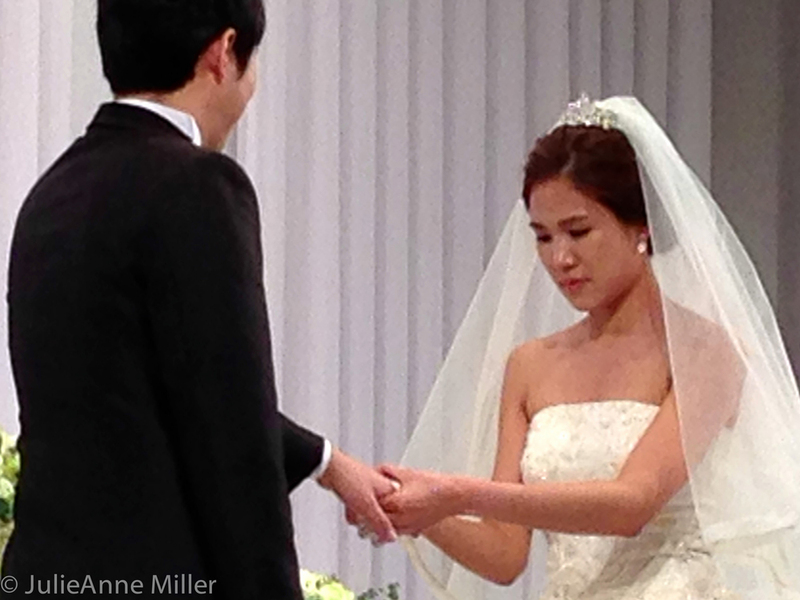 Difference #4: Many Wardrobe Changes The bride walks down the runway in her white gown to greet the groom in his tuxedo. 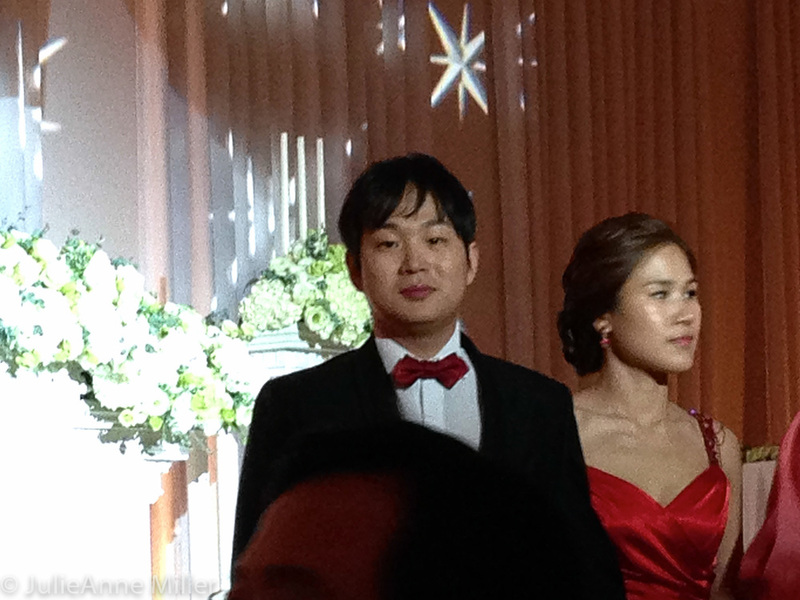 After the brief 15 minute ceremony, the couple exits the hall while lunch or dinner is served. The bride returns in a more comfortable, colorful evening gown. They eat and then greet guests table by table. As dessert is being served, the couple again disappears. Close family members move to a small, intimate room. Parents are seated at a low table decorated with an assortment of food and other items. 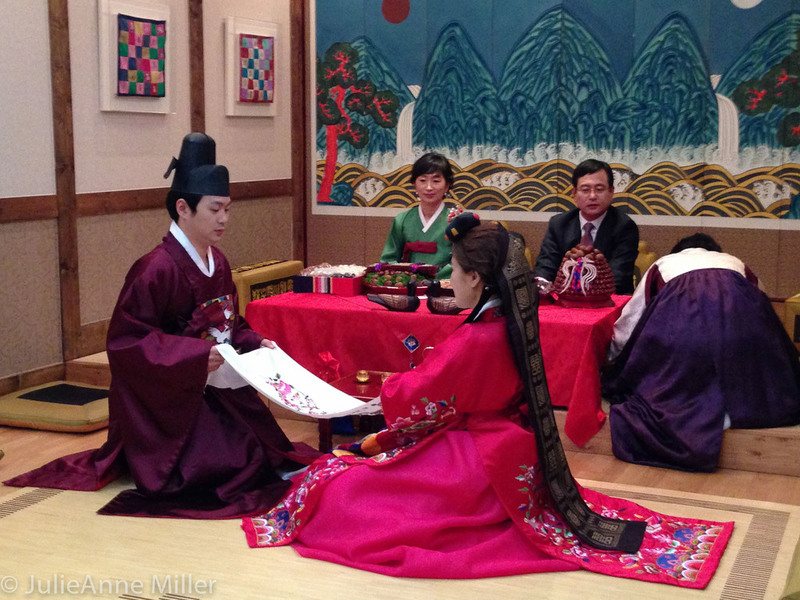 The couple enters in traditional hanbok to pay homage to the parents with the pyaebaek 폐백 ceremony. 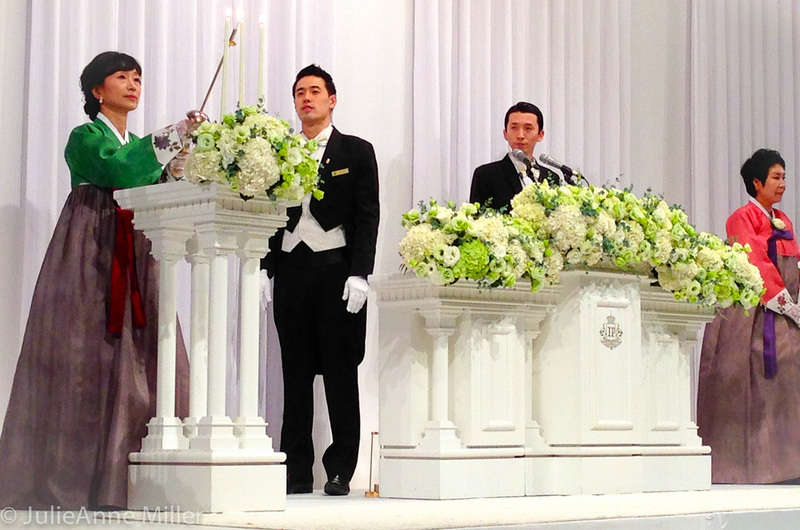 The website "Not Just Rice" describes the pyaebaek 폐백 ceremony in lots of glorious detail. Worth the read! 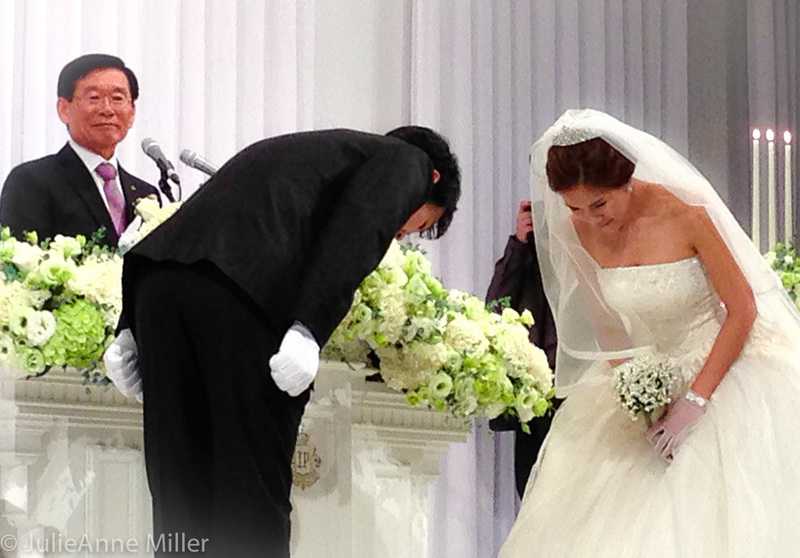 All in all, the bride changes outfits at least three times in less than two hours. Very beautiful, but can't help thinking $$$! Guests present money (crisp new bills) in white envelopes, rather than gifts. The dress code is usually business attire. 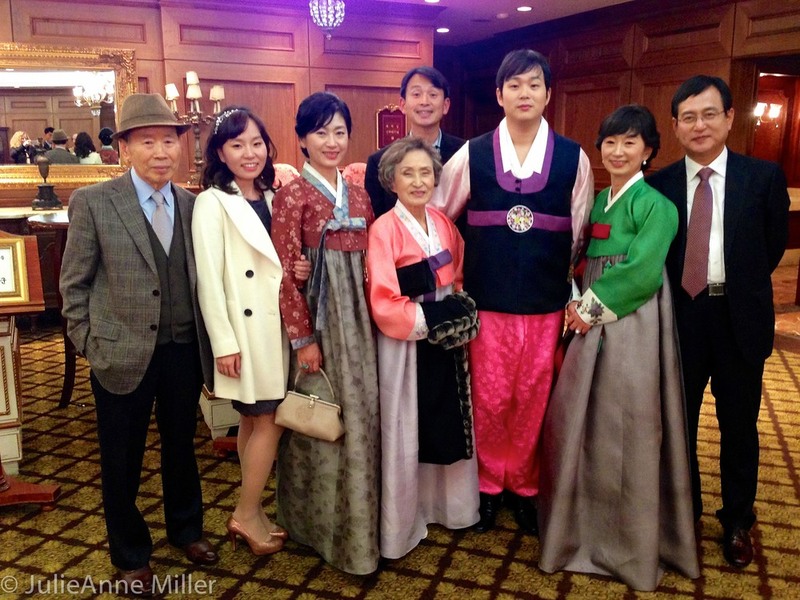 Family members may wear traditional hanbok, but not required. A verbal invitation is as official as a printed formal invitation. And inviting co-workers is the norm. Relax, enjoy. Weddings are less stiff and formal than a western event. Have fun!